High-protein meets high simplicity. My mom makes something like this for potlucks, and people rave about it. The gist: cook & cool quinoa, chop up whatever veggies you want in there (quinoa to veggies ratio 2:1 – 1:1), and toss with olive oil & lemon. Pretty much any variation on that turns out great. The protein-rich quinoa makes this filling enough that it can stand on its own as a simple meal. Prepare quinoa per package directions. I prefer it a little crunchy, so I use 2/3 the water they call for, then cook it for a shorter time. Quinoa has more of a tendency to burn than rice does, so watch it — when it gets to the point that the top is flat except for the holes where the steam is escaping, remove from heat and transfer to a bowl that can take the heat. You can cook it in a rice cooker, but unplug the thing and remove the inner bowl as soon as it’s done, or it’ll stick. While quinoa is cooking, chop up everything else. Whisk together olive oil, lemon juice, cumin, cayenne, & cilantro in a small bowl. Wilt spinach or arugula in pan & set aside. Optional: shape quinoa into a donut shape in the bowl and let it cool in fridge. Toss quinoa with oil-spices mix. Test & add more olive oil or lemon as necessary. Also good in this: celery (2 stalks), garbanzo beans (1/2 can), cucumber (1/2 – 1 c, peeled and chopped small), a little mirin / sherry / apple cider vinegar instead of the soy (adjust spices accordingly). 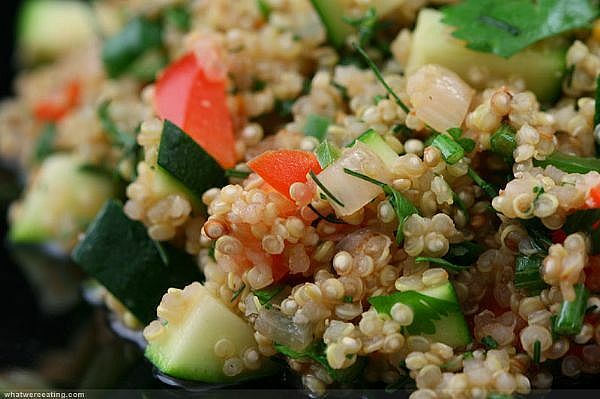 The salad in the photo — quinoa, pine nuts, cucumber, tomato, onion, parsley, olive oil, lemon.